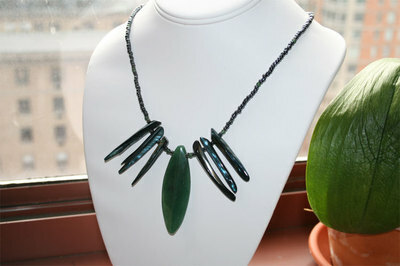 I needed to take some photos of the jewelry I'm going to be selling at the Urban Inspirations show in March. So, I thought I'd share those photos with you. Most of my jewelry is one-of-a-kind, so it was interesting to have to come up with some designs that were easily replicable so that I could make several of each piece. Freshwater pearls are a kind of pearl that comes from freshwater mussels. Natural freshwater pearls are seldom perfectly round or even nearly round, more often than not they are baroque, slugs, or wings. Freshwater pearls are noted for their wide range of color. Although white is the most common color, the most desirable are the pastel pinks, roses, lavenders, and purples. Millefiori is a glasswork technique, which produces distinctive decorative patterns on glassware. The term millefiori is a combination of the Italian words "mille" (thousand) and "fiori" (flowers). The Millefiori technique is a labor-intensive process. Each Millefiori item is individually and painstakingly handmade. 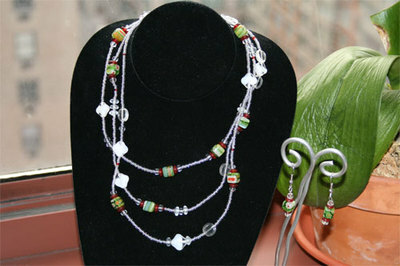 Made from Sterling Silver and Jasper. 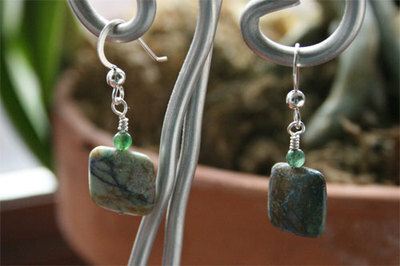 Jasper is a dark green, semi-translucent to opaque form of semiprecious chalcedony. The name means "spotted stone." 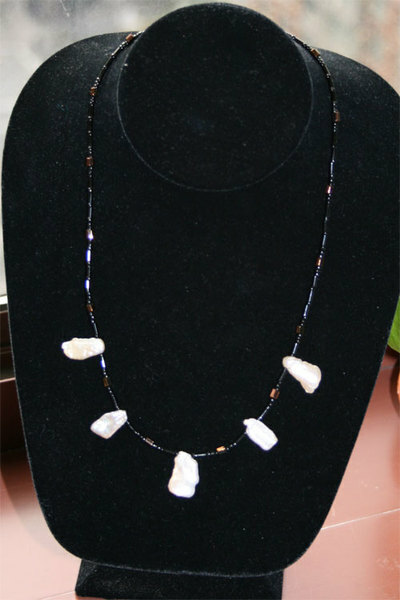 Jasper is said to strengthen the stomach and is believed to cure gynecological problems. It is also thought to drive away evil spirits and protect against snake and spider bites. I also updated the "jewelry album" at right with some more photos of my recent work. Feel free to tell me what you think of any of the pieces! ETA (3am): Just found out that a layout of mine received an honorable mention in the Fiber Scraps contest! They displayed the ten winning entries in their booth at CHA (the Craft and Hobby Association trade show) this weekend! How fun! In addition, I will receive a prize package and FiberScraps may use the image of my page in their advertising! Very cool! Wow! Got another layout picked up today. Simple Scrapbooks has requested one of my all time favorites. It's my first time in that mag and I'm very excited! Thanks for letting me share my excitement! Yay! Lots of Good News! I am very excited to share two exciting opportunities that came my way today! (1) Maelynn Cheung is writing a book for Leisure Arts called Doodling for Papercrafters. She has requested two of my layouts for the book! It is due for release May/June 2007 and will be distributed mainly to craft stores, such as Michaels and Hobby Lobby. It is possible that the book will also be available at large size book stores, such as Barnes&Noble. I will update you as the release date gets closer. (2) Last year, I submitted a layout to Legacy Magazine. It's one of my absolute favorites! They accepted the art work several months ago and I mailed it to them for professional photography. Today, I got an e-mail from them asking if I would like to write an article to accompany the art work! This is sooooooo exciting! I have wanted to write magazine articles for a long time and I feel like this could be the beginning of something truly great. I am absolutely thrilled! So, I've made many wearables. 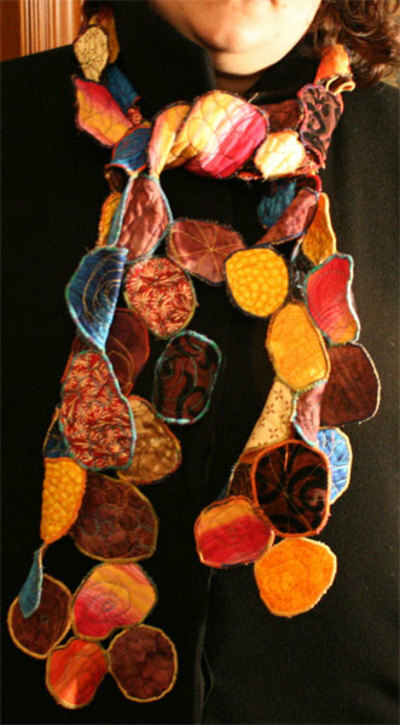 Some quilted necklaces, jackets, etc. I've also made a lot of beaded jewelry. But, nothing has attracted attention the way that these scarves do. I feel like it might become a full time business selling these! Not a day goes by that somebody doesn't ask me for my business card! "Where can I get one?" It's very gratifying, but they're a lot of work! There's about thirteen hours of work in each of these babies! I'm trying to branch out and make them even more sculptural. I'm experimenting with felt and other materials. I'll share when I can! I have a problem designing for contests. I was thinking about this in regards to the quilt I just finished making for the Empire Quilters' Urban Inspirations Show and I spent much of yesterday working on a layout for Creating Keepsakes' Hall of Fame. Over the last month, I've also entered four or five other contests. But, I've been dissatisfied with my work for all of them. "Insist on yourself; never imitate. Your own gift you can present every moment with the cumulative force of a whole life's cultivation; but of the adopted talent of another you have only an extemporaneous half possession... Do that which is assigned to you, and you cannot hope too much or dare too much." And I am reminded that I should let "me" be more present. I guess the question is, why do I think that "me" is not enough?